The City of Montrose owns and maintains these two lakes and the camping areas around. 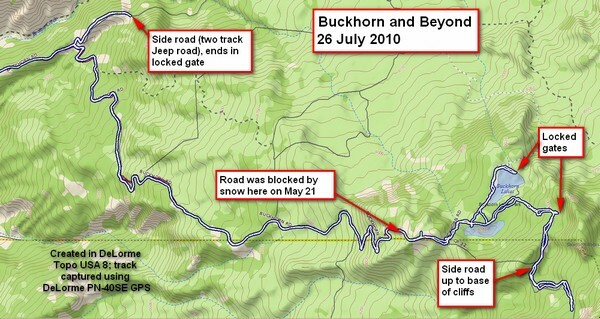 This is a continuation of the trip up to Buckhorn on May 21st (here) and posted on June 4th. Figuring the roads were long dry, I headed up there after dinner this evening. I went beyond the lakes to revisit a trail that goes right up to the base of the cliffs. I would rate Buckhorn Road as beginner, with beginner+ at the upper reaches due to the ruts. The side road is definitely rated intermediate. Buckhorn Road is accessed from US Hwy 550 a few hundred feet north of Colona, just barely north of the Montrose/Ouray County Line. It’s paved for several miles (watch for a stop sign and turn right to continue), then turns to well-maintained gravel with some washboarding, then turns to a dirt road that still has lots of ruts. Do be careful of the ruts! There are two lakes, neither very big. Campsites abound, some with picnic tables, otherwise primitive. I find the area beautiful and primeval. A bovine road hazard. 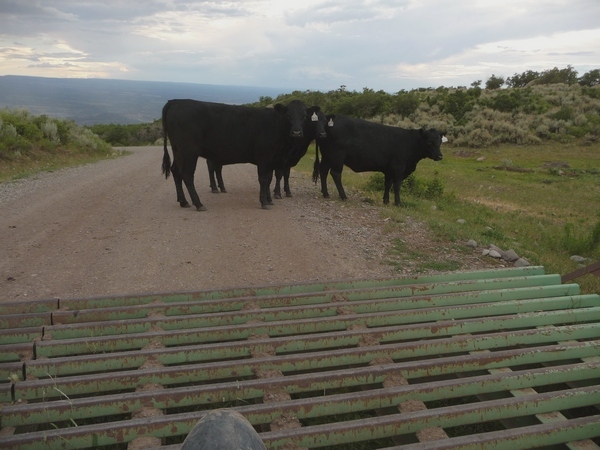 I stopped short of the cattle guard (you can just see my front fender). These cattle simply didn't want to move! I waited for awhile, then gently edged across the cattle guard and well to the left. The bovines were kind enough to move about two feet to the right. Stubbornest cattle I've seen. Going past the lakes, the road climbs steeply toward a mountaintop radio facility, and is blocked by a locked gate a few hundred feet before you get to the top. If you backtrack a hundred feet or so, there’s a side road heading south. Well, road might be overstating things— two Jeep-spaced tracks that toward the end look more like a double track. The road features a number of mudholes still full of water. Many can be avoided (if you’re on two wheels), but some simply have to be crossed. I pick a line that corresponds to a tire track, figuring I’ve got the greatest chance of not hitting some hidden rock. Some of the mudholes are rather deep (a foot or so). I came across a mudhole when I wasn’t expecting one and fortunately had the presence of mind to power through it without incident. I finally turned around when the road itself turned muddy, I’d say a couple hundred feet from the end of the road. Here's the view a bit down the road from Buckhorn Lakes, looking to the southwest. On the way down I stopped to take pictures of wildflowers. Unfortunately, the light was fading so the camera was using low shutter speeds, which means blurred pictures. Too bad. I took a picture of the view using a tiny Joby tripod wrapped around the handlebars and set the camera on timer so it would be sharp. 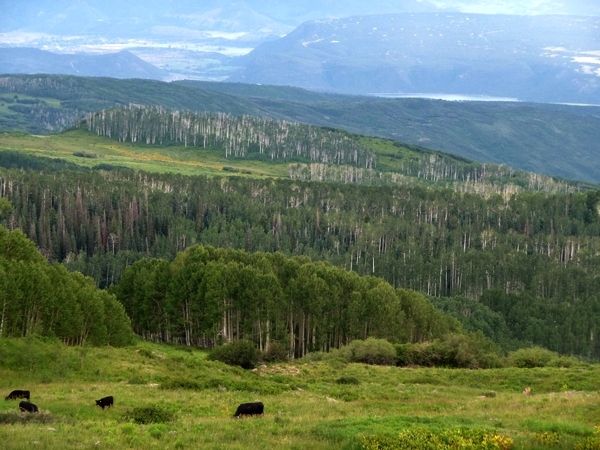 The view looks across meadows and down into Pleasant Valley on the upper left. You can just see a sliver of Ridgway Reservoir at the upper right. As it turns out, my house is in the picture. The DeLorme PN-40SE GPS worked very well this evening with no track lapses. Hopefully this track is helpful to you. Refer to the earlier post for the rest of the track down to the highway. Here's the GPS track, showing the upper half of Buckhorn Road, the two lakes, and the side road up to the base of the cliffs. Note that the roads shown in gray either do not exist or are private. Buckhorn lakes is open now, @faye I believe it opened up the 17th from road maintenance. I heard the road was closed as they were working on it. Does anyone k.ow if its open as of fathers day? ?